Customers leave the Apple store in Brooklyn, N.Y., Jan. 3, 2019. Apple's warning that its Chinese sales were weakening ratcheted up concerns about the world's second-largest economy and weighed heavily on global markets Thursday. 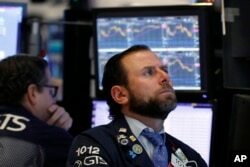 The widely watched Dow Jones industrial average of 30 prominent U.S. stocks plunged 2.8 percent — more than 660 points — by the close of trading, after stock indexes in Europe and Asia closed with smaller losses. Apple's stock was down nearly 9 percent. The stock declines came after Apple announced late Wednesday that its holiday sales were lower than it had expected, especially in China, the world's second-biggest economy after the United States. In addition, a key gauge of U.S. manufacturing unexpectedly hit a two-year low in December, indicating weak demand and exports. Apple Chief Executive Tim Cook blamed the company's sales shortfall on the trade battle President Donald Trump is waging against China. "While we anticipated some challenges in key emerging markets, we did not foresee the magnitude of the economic deceleration, particularly in greater China," Cook wrote. "In fact, most of our revenue shortfall to our guidance, and over 100 percent of our year-over-year worldwide revenue decline, occurred in greater China across iPhone, Mac and iPad." Specialist Michael Pistillo, right, works on the floor of the New York Stock Exchange, Jan. 3, 2019. "It's not going to be just Apple," Hassett told CNN. "There are a heck of a lot of U.S. companies that have sales in China that are going to be watching their earnings being downgraded next year until we get a deal with China." "That puts a lot of pressure on China to make a deal," he said. "If we have a successful negotiation with China, then Apple's sales and everybody else's sales will recover." The U.S. economy remains strong, with the country's 3.7 percent jobless rate at a nearly five-decade low. But economists say the U.S. economy could be slowing, and uncertainty in global economic fortunes has led to volatile daily swings in stock indexes in recent weeks. In 2018, U.S. stock indexes suffered their worst year in a decade, with most of the losses recorded in December. The Dow was off 5.6 percent for the year, with the broader Standard & Poor's index of 500 stocks down 6.2 percent.